Take the Brokaw Rd. exit toward First St.
You’ll see Fry’s Electronics on your right as you approach Junction Ave. Turn left onto Junction Ave. 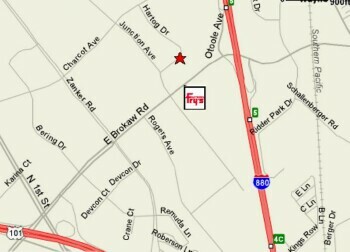 Turn right onto Hartog Dr. and right in the first driveway 1876 Hartog Dr.
880 North to Exit 5 Brokaw Rd. Turn left onto E. Brokaw Rd. You’ll see Fry’s Electronics on your left as you approach Junction Ave. Turn right onto Junction Ave.
From Highway 880 South take Exit 5 toward Brokaw Rd. Keep left at the fork to go on Otoole Ave. Turn right onto E. Brokaw Rd.